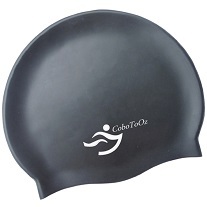 CoboToOz is a company that sells top of the range silicone swim caps on the world’s biggest online retailer. Our swim caps are made from the finest quality silicone and are quality tested before they leave the factory. They do cost more that latex caps but they won’t be ripping on you when you least expect it. Caps that are made from silicone are, in many respects, the best that money can buy. There are many reasons for this which include superior tear resistance, comfort when wearing, zero toxicity, non-allergenic and better thermal insulation. Because they are so stretchy and soft, the one adult size will fit all and they are perfect for both men and women. Buying swimming caps online is easy and convenient, that’s why more people are doing so all the time. There are many reasons why people wear a swimming cap. One of the reasons is that many people don’t want to get their hair wet, and that could be for a number of reasons within itself. There are chemicals in the water of swimming pools, the main one being chlorine. Getting these chemicals into the hair doesn’t do it much good at all. It can bleach it and leave it weak and friable. When swimming outside, the sun can do a lot of damage to the hair, leaving it dry and brittle. The bathing caps will not keep out the water entirely, but it will reduce wetness substantially. It will keep the hair out of the pool plus keep the main bulk of splashes off too. Silicone swim caps are thicker than latex caps and can keep the heat in the body as silicone will keep the heat in. Another reason is performance related. To decrease the friction against the water while swimming, competition swimmers use swim caps. The water will stream past the flat surface of the cap letting the swimmer to get through the water far quicker than if they didn’t have one. 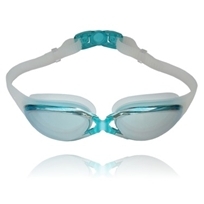 If you are looking for some eyewear to go with your cap, you may also be interested in our swimming goggles. Are there any swim caps that keep hair totally dry? Not really. There are swim caps that totally cover the ears but even those don’t keep all of the water out. Swim caps don’t create an absolute air tight seal around your head. There will always be some water that gets in but the cap will keep the majority of the chlorine in the water off your hair so it will help to reduce damage substantially. Plus swim caps move around the head as you swim and so the hair at the back of your neck will more than likely get exposed, therefore wet when you are swimming. What reasons do people wear swimming caps for? There are a few reasons. Check out our post here http://www.cobotooz.com/why-do-people-wear-swimming-caps.html. It helps to keep the majority of chlorine out of your hair which prevents it from being damaged. If you wear swimming goggles, it helps them to stay on better. It keeps any hair product, dandruff and lose hair out of the pool. If you wear your hair long, it keeps your hair out of the eyes, nose, moth and ears and stops it from getting matted and tangled. It helps you to swim faster because there is less hydrodynamic drag, if you swim laps or are a competitive swimmer.